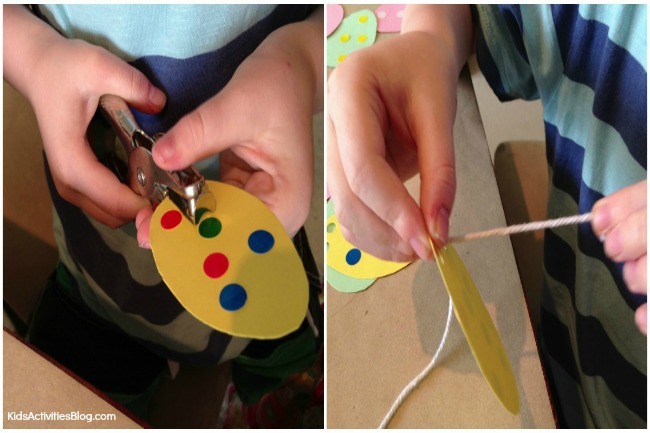 Easter crafts for kids can bring smiles to the craft table and brighten your home as sweet decorations. 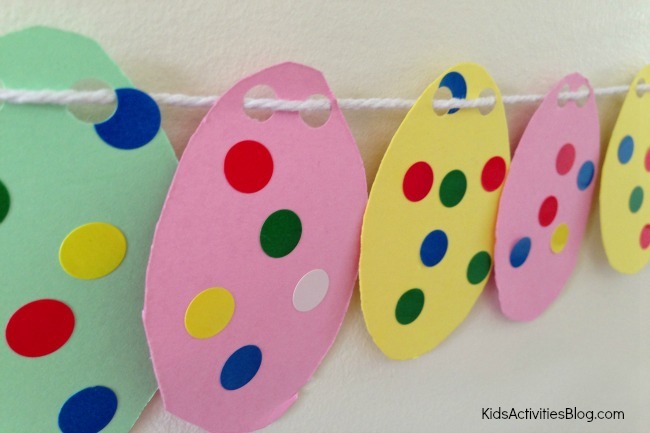 Here’s a great idea to make a garland of Easter eggs that can also be a countdown to Easter. 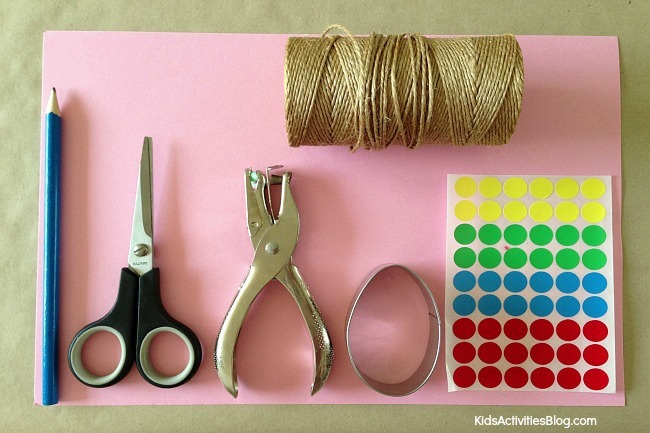 Kids Activities Blog loves simple decorations like this that kids can make. 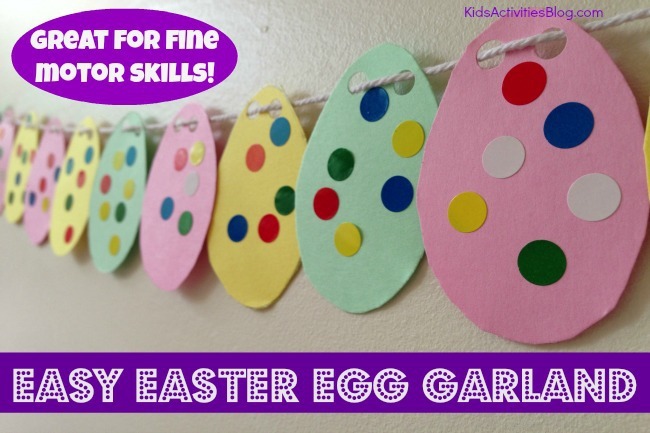 We made this cute and colorful Easter garland and it turned out to be a fantastic opportunity to practice some fine motor skills. Not only was it fun and quick to make, but my son also adapted it into an Easter countdown activity. We began by drawing Easter egg shapes on our paper. We traced around an egg shaped cookie cutter but you could draw the eggs freehand if you didn’t have a cookie cutter. This was a great opportunity for practising the pincer grip. 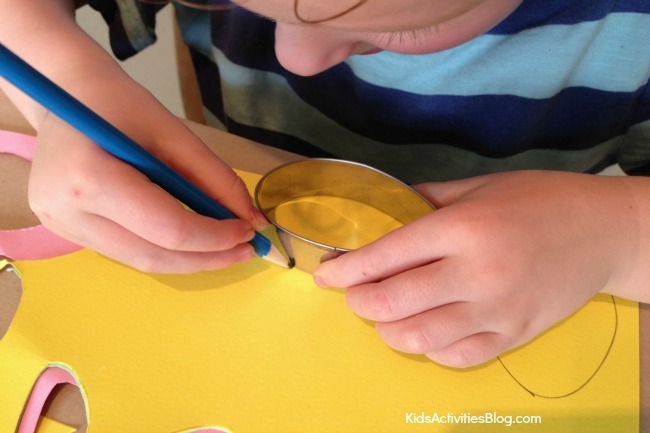 After drawing your egg shapes on the paper, cut the egg shapes using the scissors. After the egg shapes have been cut out, it’s time to get decorating! We stuck dot stickers onto the eggs. This was a fantastic activity for practicing fine motor skills. 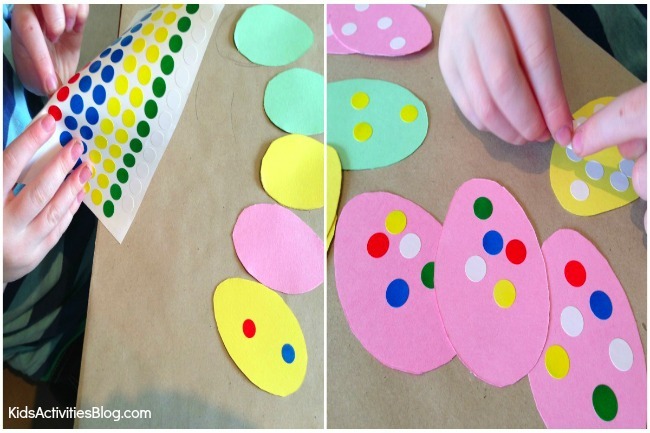 If you don’t have any dot stickers on hand, any stickers would look fun and colorful, or why not have your kids decorate the eggs using colored markers, paint or glitter. Once all the eggs were decorated, we used a hole punch to add two holes at the top of each egg. This was another great fine motor skills activity and a brilliant opportunity to strengthen those hand muscles – very important for mastering handwriting later on. After making two holes in each egg, it was time the thread the eggs onto some string so that the garland could be hung on the wall. Threading is yet another fantastic way to practice fine motor skills. My son really enjoys threading and he had a great time stringing these eggs. After threading all the eggs on to the string, it’s time to hang up your garland and admire your colorful work! We hung ours on the wall but it would look so colorful and fun across a window or even under a door frame. After we had hung up our garland, my son decided that he wanted to use the garland for a countdown to Easter. He came up with the idea that we would take all the eggs off the string and that each day from now, leading up to Easter Sunday, we will thread one egg on to the string so that the garland will grow as Easter approaches. I love that he came up with this idea on his own and we are now excitedly counting down to Easter with our colorful dot sticker garland! To jest w rzeczywisto?ci wspania?y kawa?ek:) Dzi?ki dla pracuj?cych na rzecz blogÃ³w. this image jest z pewno?ciawystrza?owe.